I received my skull cap helmet today and I'm absolutely in love. It's everything you said it was and fits awesome! Thanks a ton for making a quality, well fitting helmet! Just wanted to say Thank you I've been wearing this helmet for 3 years - 3 weeks ago had a car hit me head on at 40 mph Flew thru the air 30 feet broke pelvis - hand -leg and alot of rash but no head injury Even though helmet is trash now it did the trick and saved my life along with alot help from the big man upstairs THANK YOU!! I just wanted to say thank you . I've got a big head and had a good fitting helmet in 20 years . My new daytona helmet fits perfectly . I was amazed at how light it was . I also purchased a full face for my son in law and he loves his also . Thanks for a superior product at a reasonable price . Yesterday I had a low side accident at 55mph. The only thing I remember is the back tire going out from under me and my head hitting the ground. I was released from ER 4 hours later after a brain scan. I came out of it with only some road rash on my leg. I'll be ordering another one. This ank you! Here's link to the pic of the helmet. Hello, I want to take a moment to thank you for producing such a high quality product. Unfortunately, I was in a bad motorcycle accident, in which I was hurt quite badly (10 broken vertebrae and some broken ribs). By the grace of God, I’m still able to walk and have retained all of my faculties. During the accident, my head struck the asphalt quite hard while wearing one of your 1/2 helmets. Even though I loss consciousness and rolled an unknown number of times, I sustained no major head injuries. Thank you for providing a great product and a fair price.
" You'll see me again as a satisfied customer. A+ "
"I wanted to thank you..."
I wanted to thank you for making a great helmet. I had to lay my motorcycle down in heavy traffic to avoid an accident . Walked away with road rash, dislocated shoulder and a lot of soreness. I banged my head on the pavement so hard it bounced and tore the helmet up. I was wearing a Daytona Cruiser 1/2 helmet with pull down visor. There is no doubt it saved me from serious injury or death. Thank you for a great product. Thank you SO much! My older brother had a motorcycle crash involving a Toyota RAV-4 and his Honda Shadow. He was wearing one of your German style helmets and it saved his life. All that was wrong with him is he lost 3 teeth. It totaled the bike and cracked the helmet's brim, but he was fine. He hit going 45 mph, bounced off of the Toyota, and rolled out in front of traffic. He stood up and walked to the other driver before calling 911. I would like to say thank you for protecting my brother and other riders alike. On October 21st, 2016 I was in a hit and run on my harley davidson while wearing your 3/4 helmet. I was going 40 and they were going 75 behind me. Hit me and dragged me 200 yards and left me unconscious in a puddle of blood. A lady stopped and found me in the road and waited until an ambulance arrived. The person was never caught. I survived and have nearly made a full recovery from my injuries. The helmet was in 4 pieces still attached to my head covered in blood. Your helmet saved my life and I am more than great full for that. I just finished building another bike and I purchased the same exact helmet from you. I will let forever trust your product and will only buy and recommend your helmets as I would have been dead if it weren't for your amazing product. Thank you very much to all of the men and women working in your facility. You may not think so but every day you work you are saving people's lives. Thank you for saving mine. This helmet saved my life. I was in a accident at 55 mph and this helmet really took a hard impact and did a great job. Would not be here with out it. A voice from above, man that'll get yer attention!! nose....there that's better). I know it may sound silly to some, getting all excited about a stupid helmet, but it is the truth ( my wife just rolled her eyes and shook her head, "Another helmet?!") My wife is now very happy for me but she has absolutely drawn the line on me wearing it to bed (go figure) This thing is soooo light, fits just perfect and NO MO MUSHROOM HEAD! And D.O.T. approved to boot.... y'all got a fan for life! Daytona Helmets Rock!!! Keep up the good work. ~Byron McClure a.k.a. "HardLuck Harley" a.k.a. "Hard-of-hearing Harley" a.k.a. "If you bring that bike one more time into this house, you'll be sleeping with it" Harley"
Bought 3 of the 1/2 shell DOT approved helmets for 2 of my buddies and myself. All 3 of us absolutely LOVE these helmets! They are lightweight, comfortable, and look great! Customer service was awesome and I would highly recommend using this company! Overall I'd rate them an A+!!! Just got it in and must say compared to the bell modular helmet It replaces, this helmet is much more comfortable, lighter and has more features, the quick release chin strap works great, the chin guard does not rub my chin like the old Bell. Only reason I didn't give it 5 stars is because I haven't had a chance to get the blue tooth communications installed but it's nice that it comes ready for it without having to modify the inner liner as I did to the old helmet. Everything they say about it is spot on except the didn't mention the free pinlock anti fog inner shield, that thing works great, huge difference with/without. The price is comparable to the old helmet with more features!! Very good helmet , well constructed, old helmet would move around in speeds over 60, this helmet fits snug and has no movement. Also i like 1 hand unlatch feature. Highly recommended. Recently went down, hit a curb at about 30-35. I got thrown off and my head hit, along with my left side. Helmet didn't crack and I walked away fine. Definitely will be getting my next helmet from Daytona. Thanks for your superior equipment! I was wearing your gloss German style helmet at the end of this July when I wrecked my bike doing probably at least 70 mph. I broke the front brim of the helmet and my jaw. But the general consensus is that I probably should have died. I am writing to let you know 3 things. One, the general need to wear a helmet. Two, I really believe your helmet kept me from breaking my nose, and crushing my skull! And three, I plan on getting another helmet. Maybe 2. I got a new bike so I'm back on it. It's flat black. It looks sharp, lol. I think your German style helmets are comfortable and they look good. And your helmet kept my brains where they should be. Thank you! Interestingly enough, when I bought my version of this helmet it was labeled as DOT compliant and that's why I purchased the helmet. It's been the perfect 1/2 helmet for our warm-weather here in Georgia and just doing side-by-side comparisons with other DOT 1/2 helmets I've continued to wear it since seeing it's no longer sold as a DOT compliant helmet. The retention system is fantastic and perhaps one of the DOT-related issues. That said, when I need to replace this helmet I'll likely go with the same model, DOT labelled or not. Hi Sheryl. Just wanted to say that the MG1-C-3XL D.O.T. DAYTONA GLIDE- HI-GLOSS WHITE (Size: 3XL) helmet I ordered from y'all is awesome! Thanks for the quality and function in an affordable product. 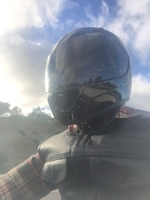 I was looking for a secondary helmet, mainly for night time riding. After wearing it for a test ride, I found myself liking this more than a Shoei helmet! Does not feel cheap, thick padding, but at the same time does not squeeze your cheeks, super comfortable. Measurements are accurate. The sun visor has no external slider, instead you slide it down like the exterior visor (no chance in getting it off the track or breaking like other helmets with internal visor). There are no "wavy" visual effects like cheaper internal helmets with visors have. Wind noise is average, nothing to complain about. Chin strap is of quality built and easy release mechanism. Very simply looking helmet but feels like it should be over $200. For $100, there are no other helmets that can compete with this. On September 16th I was on my way home from Oklahoma City to meet up with some of the guys I rode up with. I took the exit and the rest is blank. I evidently went off road and hit a culvert and getting thrown from the bike. I did suffer a slight concussion but I was told by the Doc that if I had not been wearing my helmet it would have been so much worse. I bought this helmet about 3 years ago and have been using it since. I love the fit and the protection it has obviously offered me. It is definitely above the DOT standards. I just want to thank the company for being such a quality helmet provider. I will definitely be wearing the same kind of helmet once all is said and done. I am doing much better today and just waiting for insurance and such to get settled and then I will be back on the road again wearing a daytona helmet of course. I had neck and back surgery in 1998 everything went very well, however, I now have neck problems. After having physical therapy for a week I felt like a new man. I then rode my bike all day returned home and I was back to square one with much pain. My doctor said it might be my helmet. I looked to you guy's in search of a very light helmet. I ordered the half Skull Cap Helmet and it's been pain free riding everyday. I love my helmet and thanks for the great customer service. Oh yea I also bought the ear warmers they fit and work very good. Had a lot of helmets over the years from HD to Bell and everything in between. This is by far the best helmet I have ever owned. Love the attention to detail, quality and perfect fit! Good job Daytona. I will be wearing nothing but your helmets from now on!! I ride a Yamaha Zuma 50 Scooter. Recently I replace my Non DOT helmet with a Daytona dot skull cap without visor. Saturday night A car pulled out and hit me it was their fault. I was knocked unconscious. The paramedics that responded told me I would have died if I was not wearing this helmet. Getting this helmet was the best investment I have ever made. The helmet was lightweight and very comfortable. I was rear ended last summer on the interstate, the only reason I'm able to write this today is because I was wearing one of your helmets. Cannot say thank you enough for making it possible for me to make it home to my family. I wear my helmet 99.9% of the time. Frankly the only time I don't wear it is when I am blowing the water off after I wash it. Fortunately I had my Daytona Skull Cap Leather helmet on for this last ride of mine. We were a group of 13 riders doing what we call "The Stanley Loop" which is a 6 hour ride and about 350+ miles. One of our riders collided with oncoming traffic and cause the rider next to me and myself to go down. I was able to dodge the bike and rider next to me, but I collided with some debris that made a taco indentation in my front rim and ejected my passenger and I about 30 ft. Fortunately my skull cap too all of the damage to my head, but I still sustained a sever laceration to my left arm, broken foot and broken finger. My passenger sustained 3 fractures to the pelvis and a bone chip in the left fore arm. She was also wearing a helmet and only got a small scuff. I am here today writing this because I was wearing my favorite helmet of all time. If you are on the fence about this brand, you need not look any further. BUY IT, and WEAR IT. Regards, Mighty Mouse. Thanks for a great helmet that didn't break the bank. Great helmet for the price. Good quality, great value. Good fit and doesn't look like a mushroom. 1 suggestion- add the bigger visor , it does wonders and is dirt cheap. Best fitting helmet ever! That covers 40+ years. Thanks for a great product will recommend to all. Can't go wrong with this helmet. Your helmet saved my son in laws life ! I purchased my son in law one of your helmets as a CHRISTMAS gift last year . He had the misfortune of having a serious accident last night and your quality product has no doubt saved his life . The bike is totaled and he's got serious road rash but he will recover . From the bottom of my heart I'd like to thank you . Without your helmet my daughter would be without a husband and my grandchildren without a dad . Thank You ! I recently purchased a skull cap from Daytona Helmets. After receiving there was an issue with the strap so I contacted customer service which was so easy to do. After reaching out to them I received an email the next day and until the issue was resolved they were constantly in touch. I will definitely be recommending them to friends and family. Thank you all so much! 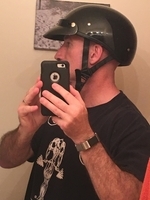 I searched for a lid for about 6 months after wearing a hjc cl max ll .My choices are limited as the hjc is a 5x,The Glide is wonderful by comparison with both comfort and air flow thru the helmet.It seems also to have less buffeting at speed. This helmet should be at the top of the food chain for choices.Many thanks to Classic Leathers in Morristown , Tn. for turning me on to this great helmet! Cruiser 3/4 helmet Fits perfectly. Snug but not too tight. The neck strap feature is great! The basic white is perfect for custom paint. The best helmet I have ever tried! Today, I arrived at San Antinio, and the helmets where here, at the hotel. Everything perfect. I can't wait to ride my bike at my return in Argentina with this jewel! The best helmet I have ever tried! I bought the helmet for comfort and price. 3X helmets are hard to find. But on December 5, 2014, I was exiting 1-75 South of Tampa to an interstate wayside, the police report said I hit gravel which I did not see at all. I slid about 30 MPH broke my ribs, pelvis and collar bone on the right side and had considerable road rash. The helmet was damaged greatly from the crash, but it clearly saved my life and I have no head, brain or facial injuries. I am currently ordering another helmet from the great folks at Daytona Helmets. You can buy with confidence!!! I have been searching for the perfect helmet so a year now.
" Without a doubt I would not be alive . . . ."
I am writing today to say Thank You! Your helmet (3/4 Face) undoubtedly saved my life. On June 2011, I was in heavy traffic in Nashville, TN, when the car in front of me stopped short. I hit my brakes too hard and hit the pavement of I-40 going somewhere around 60. I cracked three ribs, snapped my collar bone, suffered roadrash and one concussion. My helmet cracked just above the temporal line of my head. Without a doubt I would not be alive if your product was not every bit as good as you claim it to be. Again, my most sincere Thanks. ". . . . your helmet saved my life." "Express My Happiness . . . . "
I wanted to send an email to express my happiness in working with Daytona Helmets and their employees. Every time I call, I receive exceptional customer service and am always treated courteously. I would like to also thank Chris, my rep. He is amazing! He is always on top of things and delivers promptly and flawlessly. I know that if I need anything from him, he will do his best to ensure that my needs are met. Thank you for everything you do Daytona Helmets! We appreciate it! "I appreciated good people and good service from a good business." Thank you and Annette for replacing my inside shield. I appreciated good people and good service from a good business. I love my new Daytona Edge Helmet. "I can not thank you enough for making a quality helmet . . . "
I just wanted to let you guys know that your helmet saved my life yesterday. I was t-boned by a pickup truck and the bike was destroyed, but my only injuries were scrapes bruises and a cut over my eye from my glasses. The helmet has white paint on it from the truck, and I can not thank you enough for making a quality helmet. "I'm a living testimony to the quality of this helmet"
I'd like to begin by saying that this helmet saved my life. To be honest, when I purchased the half helmet I never thought it would provide as much protection as it did. Although it was approved by the DOT, I didn't really have a lot of confidence in its size. Well, I'm a living testimony to the quality of this helmet. I sustained a direct impact to the right side of my head and was knocked unconscious. After looking at the helmet, the ER doctor stated that the helmet made the difference between a visit to the ER or the OR. I'd like to take the time to thank you for such a quality product, and feel free to contact me or any of my statements for marketing. My friends and family also thank you. I also praise God for His protection. Read reviews of our products.